Morgan Stanley (NYSE: MS), Goldman Sachs Group Inc. (NYSE: GS), UnitedHealth Group Inc. (NYSE: UNH), and Johnson & Johnson (NYSE: JNJ) were among the companies reporting solid results early Tuesday. Better than expected investment banking results at GS helped that company easily beat analysts’ projections for earnings per share and revenue, while MS also posted robust investment banking growth and saw its shares surge in pre-market trading. JNJ, meanwhile, raised guidance after a positive quarter, and UNH shares jumped 1.5 percent before the opening bell after the company exceeded analysts’ estimates. The only fly in the corporate ointment early Tuesday might be WalMart Inc. (NYSE: WMT), which trimmed its earnings outlook due to its $16 billion acquisition of e-commerce firm Flipkart earlier this year, its largest acquisition ever. However, WMT shares didn’t drop too much, and investors should consider taking the guidance news in context, as it partially reflects the company expanding its business. Earnings per share at MS hit $1.17, easily topping the $1.02 third-party consensus estimate. Equity trading revenue of $2 billion was up 5 percent, in line with estimates, while overall investment banking results beat Wall Street analysts’ expectations. The closely watched bond trading figure was roughly flat year-over-year in what’s been a rough environment. Over at GS, earnings per share of $6.28 easily topped the consensus figure of $5.38. Investment banking rose 10 percent, also above Wall Street’s estimates, helped in part by strength in initial public offerings (IPOs). Trading revenue was about flat, with equities rising 17 percent while trading in fixed income, currencies and commodities (FICC) fell 10 percent. With MS and GS out of the way, investors can prepare themselves for this afternoon’s results from Netflix, Inc. (NASDAQ: NFLX) and IBM (NYSE: IBM). The last time NFLX reported, it missed analyst estimates for subscriber figures, which many analysts pointed at as the primary culprit that sparked some panic selling. Total membership additions were 5.15 million in Q2 2018, missing management’s original forecast for 6.2 million. For the third quarter, management said it expects to add 5 million subscribers, including 650,000 in the U.S. and 4.35 million in international markets. NFLX could be worth watching this afternoon as the streaming wars continue, probably one of the more interesting aspects of the stock market right now as other companies like the Walt Disney Co. (NYSE: DIS) and AT&T Inc. (NYSE: T) also make investments. Treasury yields, whose rally above key levels at 3.1 and 3.2 percent arguably contributed more than anything else to last week’s sell-off, seem to be stabilizing around 3.15 percent, and didn’t move too much early this week. Benign inflation data last week and a weaker than expected retail sales number on Monday might be easing concerns about possible economic overheating that helped lead to the yield rally. As yields smooth out a bit, financial stocks once again could be disappointing bulls by not responding to mostly positive earnings numbers from the big banks. Bank of America Co. (NYSE: BAC) became the latest victim, falling sharply Monday despite easily beating Wall Street analysts’ estimates with its Q3 results and posting strong progress in some of its key businesses. Last week, the story was pretty much the same for some of the other big banks. The weakness in financials yesterday paled next to tech, which fell more than 1.6 percent. Communication Services, which includes Facebook, Inc. (NASDAQ: FB) and Netflix (NASDAQ: NFLX), fell nearly 0.5 percent. Other FAANG names, including Apple Inc. (NASDAQ: AAPL),and Amazon.com, Inc. (NASDAQ: AMZN), also continue to slide. 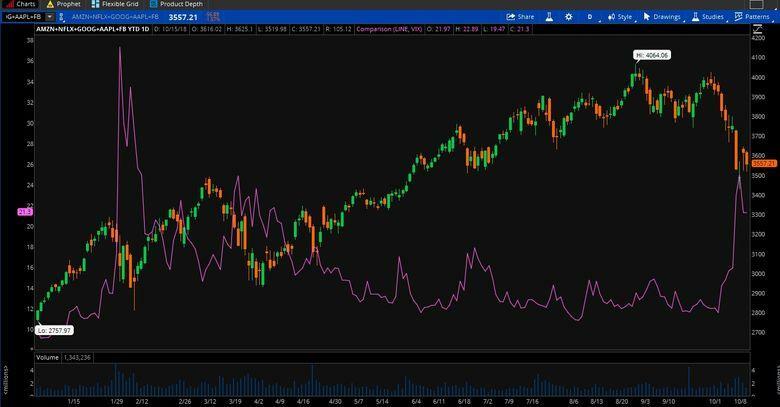 Chipmakers Nvidia Corporation (NASDAQ: NVDA) and Micron Technology, Inc. (NASDAQ: MU) took a hit, as well. Meanwhile, so-called “defensive sectors” like utilities and staples continue to top the leaderboard. All of this, along with high valuations for some of the tech names, a slowdown in buybacks ahead of earnings season, and rising yields, might help explain the recent weakness. Still, to put things in perspective, a 5 percent decline in the SPX typically occurs about three times a year, historically, so what we’re seeing is far from unusual. Only about 20 percent of the time does a 5 percent drop extend into a correction, which is a 10 percent drop from highs. Bear market drops of more than 20 percent are even less common. This doesn’t mean investors shouldn’t be cautious. It just means there’s not necessarily reason to panic. As the dollar inches back from recent highs above 96, gold seems to be recovering some of its shine. It rose 0.7 percent Monday to above $1,230 an ounce, the highest since early August but still well below peaks above $1,360 earlier this year. Tomorrow afternoon brings minutes from the Fed’s September meeting when it raised rates 25 basis points. The minutes might take on even more significance than usual, considering what’s transpired since then, with 10-year Treasury yields spiralling to decade-highs and the stock market getting slapped around. Earlier this month, Fed Chair Jerome Powell indicated that rates might still be a long way from neutral. Those comments seemed to spook some investors, some of whom had previously thought the Fed might be getting more dovish. The minutes might help investors get more of a sense of where the Fed’s feelings actually lie on the hawk-dove scale, or at least where those feelings lay several weeks ago. The debate around reasons to raise rates could also shed some light on factors the Fed is watching. Keep in mind that Fed minutes, even though they’re a few weeks old, have sometimes moved the market on past occasions. While bank earnings remain in the spotlight for now, along with the focus on what their executives say about the economy, it’s arguably other sectors that might have a bigger impact on how investors end up viewing this reporting season. “What matters more is the reaction to the guidance from the industrials and materials companies, which have wider exposure to the elements that have the market on edge about the earnings growth outlook: currency pressures, tariffs, foreign slowdowns, higher costs, and challenging comparisons,” Briefing.com noted recently. IBM reports after the close Tuesday, and though it’s a tech company—not an industrial or material—it has the kind of wide exposure Briefing.com is talking about and might be one to consider watching carefully. Around the turn of the century, technological advances in transportation and communications led to sweeping changes in the way goods and services were bought and sold in this country and throughout the world. One company emerged to lead the charge, essentially innovating its way through the sales process, from the point of sale all the way up the supply chain. Some competitors adapted; others were relegated to the scrap heap. Is this a spot-on description of Amazon.com, Inc. (NASDAQ: AMZN) in the early 21st Century? Sure; but it could also describe Sears, Roebuck & Co. in the early 20th Century. As Sears Holdings Corp. (NYSE: SHLD) enters Chapter 11 bankruptcy, perhaps the final chapter in the former retail giant’s storied history, we should remind ourselves that the market is forward-looking, not backward-looking. A company can ride yesterday’s innovation only so long. Still, at 132 years, it was quite a run.